The WildAire Wine Club enjoyed this recipe, along with paella and a few others, for our February get together. For more information about the wine club dinners, click here. I’m a big fan of La Rambla, a local tapas restaurant, and was able get the ingredients for this recipe from the owner. I found the directions on Food Network and added a few touches to make this my own. Heat olive oil in a large sauce pot over medium heat until shimmering. Add the onion and cook, stirring occasionally for 3 minutes. Season with salt and pepper. Turn heat to low, cover and cook for another 15 minutes, stirring occasionally, until the onions are quite soft and translucent. Uncover, turn the heat back up to medium and cook for an additional 5-10 minutes, until onions are golden brown and most of the liquid is evaporated. Transfer the onions to a bowl and let cool. Keep the large sauce pan for starting the Sofrito sauce. Add onion, heat to soften 3 min. Add garlic, heat another 3 min. Add tomatoes, spices, stir. Then bring to a boil and stir in the wine and sugar. Partially cover and simmer for 20-30 minutes. Add mixed spices and cream to meat and use your fingers to mix until evenly combined. Wash hands, coat hands with olive or grape seed oil. Roll mixture into 2 inch balls. Place on either silicon mat or parchment lined sheet pan, about an inch apart. Bake for 20-25 minutes, flipping once halfway through, until lightly browned. Take sauce, a couple of cups at a time, and place in blender. 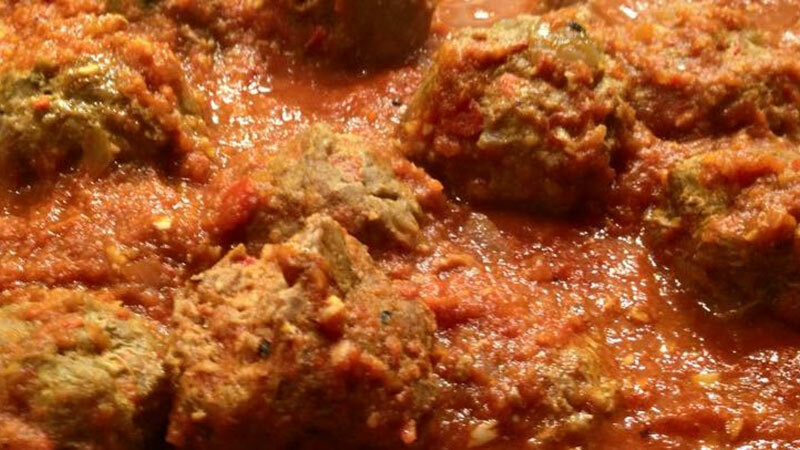 Add cream and stir thoroughly, not breaking up the meatballs. Serve with grated Manchego Cheese.